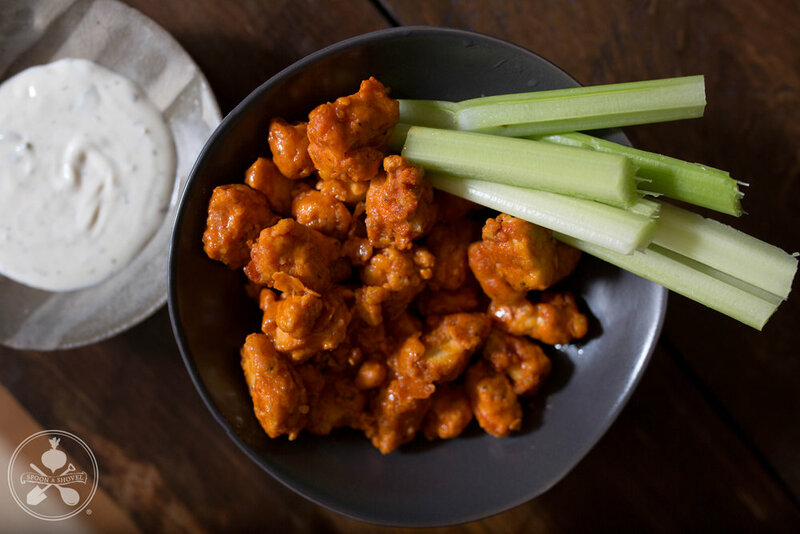 I’ve always loved buffalo sauce, and after some serious trial and error dinners my wonderful wife put up, I finally have a relatively foolproof buffalo popcorn tofu recipe to lean on when the urge strikes. It’s a bit time-consuming due to the freeze time, so double batches are highly recommended, especially if you plan on sharing with guests! -Slice tofu blocks lengthwise, and then down the middle longways, creating 4 rectangular pieces per block. Place flat on top of 2 kitchen towels, cover with 2 more towels, and top with a large cutting board or platter. Weigh down with some books to press out some of the moisture. -Remove weight, wrap tofu in a fresh towel and freeze for at least 2 hours (the longer, the better). This will help with the consistency. -Remove from freezer and let thaw. -Combine dry ingredients in a large lidded container. Rip tofu into bite-sized “popcorn” pieces and drop into dry mixture. Put lid on and shake to dry batter tofu, then add hot sauce, cover and shake again. -Spread battered tofu onto a nonstick or lightly-greased baking pan with a lip and bake for 20-30min or until visibly crisp. Flip regularly every 10min or so. -Remove tofu from oven and let cool while making the sauce. -Combine sauce ingredients. Toss with tofu pieces and serve. Common misconceptions about vegans range from us being sickly B12-deprived waifs, to being huge fans of hummus. Truth be told, hummus is a last resort at social functions for us (and we take B12 supplements, like all modern humans should). So why am I posting a hummus recipe? Because the ubiquity of the dish requires a bit of elevation, and how often do you see fuchia food? Juice of 1 lemon, ~3 T.
-Peel and chop onion and beets, then toss with olive oil and salt and pepper. -Place on a lipped pan or sheet and bake for ~30min or until onions have begun caramelizing and beets are softened and beginning to brown.Remove from oven. 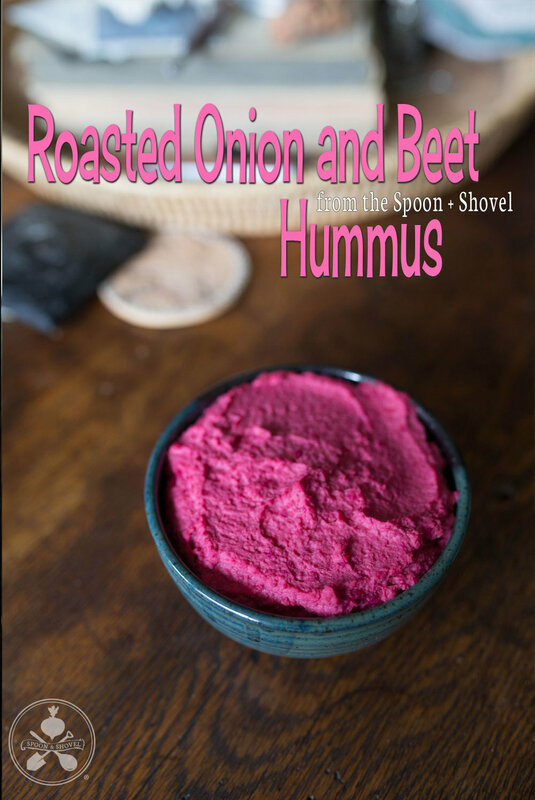 -Place chickpeas, lemon juice, 3 T. tahini, onions and beets in a food processor and combine. Add water (preferably the aquafaba from the chickpea can if you have it) as needed and taste. Add tahini, salt and pepper to taste. -Scoop out of food processor and chill until cool and serve. The mania of cooking for friends and family during the holidays is over, and I wanted to share the most popular side dish I took around to countless gatherings, these easy and impressive seitan and spinach crescent rolls! I saw on Reddit that premade crescent rolls are “accidentally vegan” and the recipe pretty much wrote itself. Add a bit of zesty sauce for dipping and you’ll be bringing home an empty tray every time. -Heat 2 T. olive oil in a large pan on medium-low heat. -Chop the onion and add to the pan, stirring to coat with oil. -Slice the seitan into strips ~2” long and set aside. -Stir the onions so that they don’t burn; you want them to just start browning at this point. -Roughly chop the spinach and add to the pan and stir gently with the onions and oil. Add some coarse sea salt (if you have it) and freshly-ground pepper and continue to stir as the spinach wilts. -Once spinach has wilted and the majority of any liquid has cooked off, transfer to a colander or strainer and return the pan to the heat. -Add the other 2 T. oil to the pan and sauté the seitan strips on each long side for ~2min each, or until lightly browned. Remove from heat. -Open the crescent rolls and separate each on a clean surface. Spread a thin layer of the onion and spinach mixture on each, then sprinkle a bit of cheese on top. Finish with 2-4 strips of the seitan, placed next to each other on the dough, and roll tightly. Be sure not to overfill the rolls or use overly-wet spinach, as either can lead to soggy centers. -Place rolls ~2” apart on parchment-lined baking sheets and place in the oven for 10-15 min or until golden brown. -Remove from the oven and transfer to a cooling rack for a few minutes before serving. -Combine mayo, horseradish and paprika in a small bowl and serve with the rolls. Seitan is my favorite “fake meat” and it took me some reading and experimentation to get to a point where I felt confident enough to share what I had learned here. I’ve actually been tweaking this recipe (mainly the process) for over a year, so you don’t have to experience the trial and error I did in my seitan journey. I hope you like this one, it’s a definite crowd-pleaser with omnis, as well as a great way to have alternative protein on hand at a serious discount to buying it at the store! A special thank you to Isa Chandra’s recipe, which I am grateful to have had as the jumping off point for my own. *NOTE: I make double batches of seitan and freeze most of it for ease of use, since it really doesn’t add much extra prep or cook time, thereby saving you the future work! -Heat a pan on medium with 1 T. olive oil and sauté chopped onions for 2-3 min or until starting to sweat. Add chopped mushrooms and continue sautéing for another 3-5 min or until mushrooms have darkened but onions have not begun caramelizing or burning. -Add beans to the pan and mash roughly with a fork or wooden spoon. Remove pan from heat. -Combine gluten, nutritional yeast, salt and onion powder in a mixing bowl. -Combine broth, aminos and remaining 1 T. olive oil in a measuring cup. -Crush sage, fennel, oregano, basil and ground pepper in a pestle, then add to the dry ingredients. -Roughly mash beans with a fork in a bowl, then add onions and mushrooms and mix lightly. -Add the mash mixture to the dry ingredients and toss lightly. -Form a well in the dry ingredients and pour in the broth mixture. Immediately begin mixing with a fork or wooden spoon until all liquid is absorbed and dough begins to stick together. -Transfer dough to a clean surface and knead with both hands until the gluten strands have formed and the dough is very dense (very few “swiss cheese” holes/no longer looks like brains). My rule of thumb is 300 kneads, which comes out to ~5 min knead time. -Bring the water and bay leaves to a boil in a stockpot large enough to place your steam basket upon. -Form dough into a log and cut into 4-6 sections. Pull each section to the desired shape/diameter and wrap tightly in aluminum foil; the tighter, the better – the dough will expand during steaming and the foil will keep it dense. -Arrange wrapped links in the steam basket and position over the heated water. Steam over a low boil for 40-50 min, making sure all the water doesn’t boil off during that time. When finished steaming, links can be grilled, sliced and sautéed, or chopped/ground depending on your desired application. They keep 4-5 days in the refrigerator, or 6+ months in the freezer. There is no such thing as too many muffin recipes, or too many ways to use fresh strawberries and rhubarb. If you aren’t hip to the hardy shrub yet, strap in, because there are a ton of ways to add rhubarb’s unique flavor to your culinary experience, and this muffin recipe is the first of a few things I have up my sleeve. -For the batter, combine the coconut oil, margarine, sugars, baking powder, salt, cinnamon and flax gel in a mixing bowl and cream. -Add the flour and mix until just combined. Add the milk slowly while mixing until just combined. -Gently fold in the strawberry and rhubarb. -Spoon batter in equal amounts into muffin cups. -Combine all crumble ingredients in a bowl and sprinkle evenly over the tops of each muffin. -Bake for 20-25 minutes or until tops are firm and edges are golden brown. -Remove from oven and let sit in the muffin pan(s) for a few minutes before cooling on a rack. It took me a few years of watching Meghan cook risotto for us to feel confident enough to try my hand at it, and it is now one of my favorite comfort food meals as the weather turns chilly! 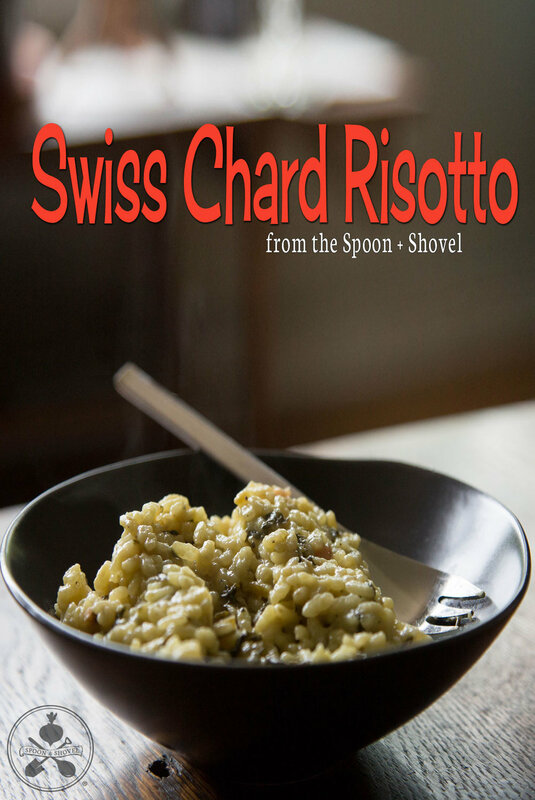 This straightforward risotto recipe features the wonderful earthy flavor and vibrant colors of Swiss chard, and some herbaceous notes of fresh oregano and thyme. -Heat oil in a large, deep pan on medium heat. Add shallots and chard, stirring to cover with oil. Cook 3-4 minutes or until shallots are translucent and chard greens have wilted. -Add oregano, thyme, rice, wine, nutritional yeast and 1 C. stock. Stir well and bring heat up to low boil for at least 1 minute. -Lower heat back to medium/low-medium and add another cup of stock once the rice has soaked up the first cup. Stir slowly and regularly so nothing sticks or burns. Continue to add stock as the liquid is absorbed or cooks down; you may not need the full 5 C. but more often than not, it will be close to that amount. -Continue to stir slowly and regularly, checking the rice first after ~20 minutes, then again every 5 or so minutes after that. Add salt and pepper to taste during this stage. When the rice is just al dente (almost entirely cooked through with a very small amount of bite left), turn the heat to low and cover for a few minutes to finish. If you are adding vegan cheese, you can stir it in at this point or sprinkle on top after plating. There’s something so thrilling about making a perfectly traditional-looking vegan pie. Most of us came to a plant-based diet after years (or a lifetime) consuming meat and dairy, and getting that balance of plant ingredients to behave like the food chemistry of your memories is incredibly satisfying. I brought this pie to my parents’ holiday party this year, and my dad said it was the best pecan pie he’d ever had! See how your family reacts – let’s win some hearts with this one. -Preheat the oven to 375° F.
-In a large mixing bowl, combine the flour and coconut oil (or coconut oil + butter/margarine) with a pastry knife. Once the dough pieces are roughly the size of lentils, begin adding ice water a teaspoon at a time, mixing until the dough sticks together, but before it’s sticky to handle. I usually end up using ~ ¼ C. total. -Place dough on a floured piece of wax paper that is twice as long as it is wide. Flour the top, press down and roll between the wax paper until crust is thin and round. Cool in refrigerator while preparing the filling. -Combine the dates, nut milk, vinegar, salt and vanilla in an immersion blender or food processor and process until smooth. -Transfer date mixture to a stand mixer and add the brown sugar, coconut oil and butter (room temperature or melted). Combine, adding the flour one tablespoon at a time until smooth. -Chop the pecans and fold into the filling. -Remove crust from the refrigerator and form into the 9” pie pan of your choice. Pour in filling and decorate top with whole pecan halves. -Place in the oven and bake for 45-60min or until the center of the pie only jiggles slightly when gently shaken. Remove from the oven and let cool for ~2 hours before serving.